Born in Carlisle, the son of sculptor James Ewing, he trained as a sculptor in England before moving to Glasgow in 1875, where he worked in collaboration with his sculptor brother, George Edwin Ewing . He spent the rest of his career as an architectural and portrait sculptor, living with his brother and family at various addresses around the city. These included: 32 Gladstone Terrace, 1875; WellHouse Cottage, Shettleston, 1878-83; 24 Woodlands Road, 1891; and latterly, 125 Hill Street, Garnethill. Some years after George Ewing left for America in 1879 (where he died in 1884), he completed his brother's Robert Burns Statue in George Square, for which he produced its trio of bronze reliefs illustrating scenes from the poet's Tam O' Shanter, The Cottar's Saturday Night and The Vision (1885-7). His most prestigious commission was for the carving of the City Chambers' Jubilee Pediment, its apex group of Truth, Riches and Honour, and the statues of The Four Seasons on the building's tower, from models by George Anderson Lawson (1883-90). 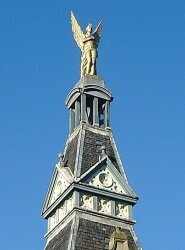 The figure of Truth is also known as Glasgow's Statue of Liberty, due to its resemblence to the similarly posed, but very much larger, statue in New York harbour. Ewing also executed allegorical sculpture for the Scottish Co-Operative Wholesale Society in Glasgow, including the figurative work on their premises at 44 Dalintober Street (1887) and their headquarters at 95 Morrison Street (1895-7). His work on the latter includes a colossal pediment group representing Justice and Brotherhood, a statue of the goddess Cybele with a pair of lions, and a concrete statue of Light and Life on its dome, which originally held an electric torch. This was removed in 1994, when it began to disintegrate. A proposed fibre-glass replacement for the statue has not yet appeared. In 1911, the statue of Light and Life was almost destroyed when a fire in the building's dome melted the statue's steel support causing it to lean over at a precarious angle. Much to the relief of the vast crowd which gathered to watch the conflagration, the statue and the building were saved thanks to the Fire Brigade's ready supply of water from the nearby River Clyde. Lost from the building's sculpture scheme, however, was a pair of reclining figures originally intended for above the main door, which were cancelled prior to carving as a cost cutting measure by the Co-Op's Building Committee. Ewing's design, including the lost sculpture, and his offer to model and carve the sculpture scheme, are now in the City Archives ( GCA : AGN 1899). His sculpture on this and other commercial buildings was commissioned by the architects Bruce & Hay , who were noted for their flamboyant, French Renaissance designs. Their buildings for the Co-Operative movement were especially grand, with multiple dormers, domes and mansards providing Ewing with opportunities for sculpting large-scale, terminal figures which enlivened their skylines. These were usually modelled in concrete in the form of a gilded, winged figure, whilst his other sculptural features were carved in stone. These include the keystone heads above the entrances to the former Commercial Bank of Scotland, 20-2 Bridge Street, one of which is a portrait of the brother-in-law of the architect Hay, Bailie Laing, a local politician (1884); the angel figure on the dome of the Co-Operative Baking Society, 2-6 Cadogan Street (1888, demolished c. 1981); and the figures and portrait medallions on the now demolished Copland & Lye's Bath Street extension (1896-98, dome figure lost, c. 1939). Ewing's best known work, however, is the angel representing Commerce and Industry on the former Ogg Brothers Drapery Warehouse, 2-20 Paisley Road West, now known as the Angel Building, which has become a local landmark and an iconic symbol of its area's regeneration (1889). He was also responsible for the winged figure of Harmony, together with two torch bearing Caryatids on the former T A Ewing's Piano Warehouse, 520 Sauchiehall Street, which also features a colossal bust of Beethoven over its rear door in Renfrew Street (1897-8). Thomas Alfred Ewing, the warehouse's owner, was the sculptor's younger brother. 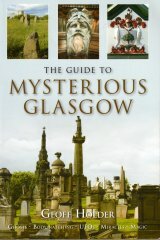 Outwith Glasgow, his identified work includes the statue of Justice on Coatbridge Municipal Buildings, which compliments a statue of Vulcan carved by the Glasgow sculptor, James Young (1894). Ewing's many portrait busts include the marble Alexander Duff Robertson (1880); Alexander Smollet (1882); and Sir Michael Connal (1894); and the cast iron Bailie James Martin, at the centre of the Bailie James Martin Fountain, Glasgow Green (1894, bust lost, c. 1974). He also exhibited genre pieces at RGIFA , 1875-98, including: Comin' thro' the Rye (1878), Bonny Meg (1879) and a portrait of Ellen Terry (1885, from a sketch by George Edwin Ewing, lent by Sir Henry Irving). He also exhibited work at the RSA , 1879-88; the Dundee Fine Art Exhibition, 1881; the Paisley Art Institute, 1892; and the Robert Burns Exhibition, Glasgow, 1896. His portrait work is represented in the collections of Glasgow Museums and Art Galleries, and the Royal Faculty of Procurators, Nelson Mandela Place, Glasgow. Married twice, he had four children with is first wife, Margaret Gilkison, whom he married on 19 July 1868, and had children Charles Edwin, born 28 August 1869, Alice Amelia, born on 4th November 1870, Edith, born 28th July 1874, and John Arthur, born 29th September 1878. After his first wife's death on 18 July 1881, he quickly re-married. His second wife was Sophia Rich, whom he married on 10 January 1883, and who died at the age of 27, on 23 December 1887. Ewing died of 'Alcoholic Pneumonia, complicated with Cardiac Disease', in 1900, his death being registered by his son James Arthur Ewing.